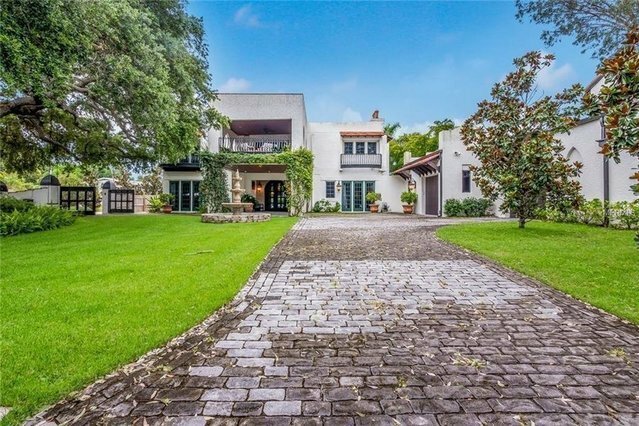 Aptly named “Casa Loco”, this property was born from the vivid imaginations of the current owners who transformed a traditional commercial building into a masterful estate. Choose to maintain it as the existing private residence - or turn it into four separate apartments, convert it into a bed and breakfast, or take it back to its original commercial use.Positioned on over half an acre, this walled and gated property often goes unnoticed, yet offers an ideal location near rich educational and cultural attractions and a short commute to downtown, SRQ Airport, and majestic Gulf beaches. Built to astonish and delight, the beautiful home features custom flooring, lavish finishes, remarkable details and interesting features. The three bedrooms on the first floor offer exquisitely outfitted en-suite bathrooms, a comfortable gathering space with full kitchen and seating area, and a home theatre with stadium seating.On the owner's floor, delight in the massive kitchen, grand living room and private master suite with sitting area and spa-like bathroom. The entire second floor offers a light, bright and airy feel accentuated by custom design details to please the eye. Collectors will delight with the six-car air conditioned garage, plus additional parking on the grounds.Options include building a second-story on the already-prepared garage area, adding a pool and spa, using the space as a live/work option or redeveloping the entire property.